GERD MÜLLER called Lionel Messi an “incredible player” after the Argentine broke his record of 85 goals in a calendar year. Much was made of the records broken by Messi as he went on to score a record-breaking 50 La Liga goals in the 2011-12 season. Nothing, however, was mentioned of a footballer who, in his day, was as big as Messi and scored goals with just as much ease. 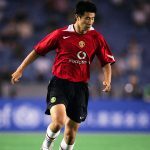 In one season he scored a record-breaking 60 league goals. Such was his fame that the baseball icon Babe Ruth wanted to meet his sporting tantamount. The man in question was William ‘Dixie’ Dean. It is a remarkable story that has all the twists and drama of a Hollywood film: from Dean nearly losing his life and being told that he would never walk again, to producing a dramatic finale a season later that would propel Everton to winning the league and breaking a goal scoring record that still stands today. It was Tranmere Rovers who first signed Dixie Dean, a man born in nearby Birkenhead. His ability quickly drew the interest of much bigger clubs – including Arsenal and Newcastle – however it was Everton’s £3,000 bid that was accepted, with an excited Dean running the two and half miles to the Woodside hotel to agree the contract. Though his signing bonus failed to live up to expectation, the same wasn’t the case for Dean himself. He was good in the air, strong off either foot, and electric over the ground. There is scarcely any footage of Dean but in one of the few clips available on the internet, it shows Dean scoring with a powerful header. It is the intense concentration and movement, even in those few seconds, that makes you realise Dean does indeed belong to those elite players over the eras. A clip of Dean in the now-legendary 1933 FA Cup final shows his lithe movement and ability to read the game that bit quicker. All it takes is a loose ball, with Dean swiftly taking the advantage before laying it onto a teammate. It is that bit of skill that will remain timeless and ultimately sought after by up and coming strikers. No matter what the era is, you can guarantee that the opposition will try to physically stop you. Part of the game is having the mental strength and awareness, such as George Best avoiding Chelsea’s Ron ‘Chopper’ Harris, to evade the defender and score. In Dean’s first full season for Everton he scored 32 goals in 38 appearances; it instantly elevated him to fans’ favourite status. However, Dean was meant to have disliked the nickname ‘Dixie’ – it referred to his hair and dark complexion, like that of someone being from the southern parts of the United States. Tragedy was to strike in the summer of 1926 when Dean, taking his girlfriend out on his motorcycle in Wales, collided with another bike. Dean’s injuries were so serious that at one point doctors thought he would die. Even after overcoming his life-threatening injuries, Dean was told to forget about football and to come to terms with the fact that he might never walk again. To the astonishment of the medical staff, Dean made a full recovery and was able to start training with Everton again. Indeed, upon returning back to the squad in October 1926 Dean scored 21 goals in just 27 appearances. Such was Dean’s prowess in the air that hilarious rumours abound that the metal plate installed in his skull after his accident was the reason for Dean’s ability and power in the air. The plate had actually been removed prior to Dean returning to football, although it didn’t stop the story circulating. The rumours that engulf the game had an early start. A true footballing great became a legend for his side with his presence raising morale, not just amongst the support but team-mates as well. With Dean back in the team it made Everton believe that anything was possible. 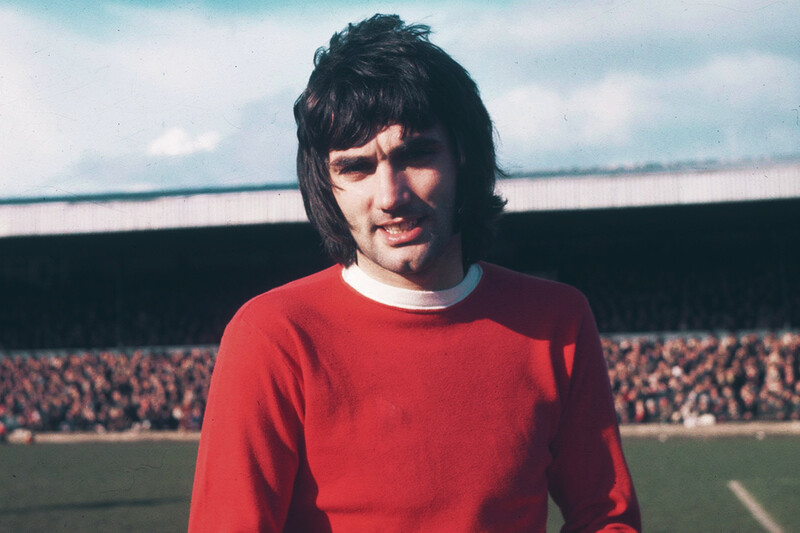 The Englishman was someone they could turn to and would deliver when required. It’s the ultimate sign of a legend. 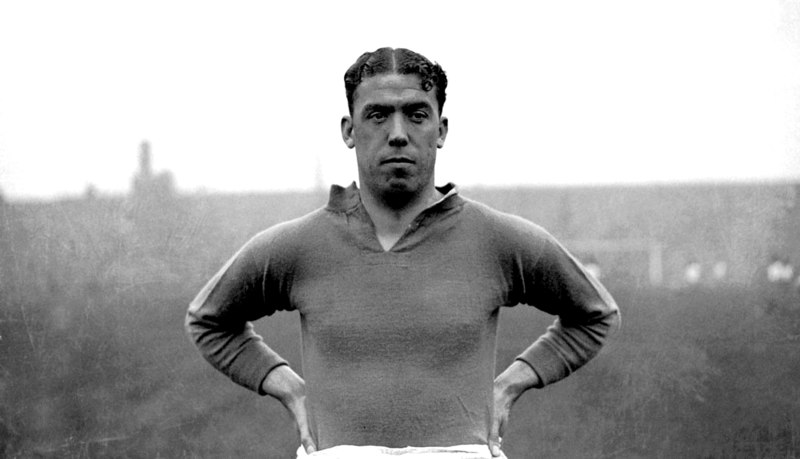 It was the 1927-28 season that was to be the pinnacle of Dean’s career as he scored a record-breaking 60 league goals – which helped Everton to clinch the title. Huddersfield led the table, with Everton trailing the Yorkshire side by four points in the mid-March, boasting a game in hand over their Merseyside rivals, too. Everton, though, demonstrated the mentality which is needed to win a league championship by embarking on an eight-game unbeaten run, winning six and drawing two. It was Dean’s two goals in a 4-2 win against Blackburn – on April 6 – that was seen as driving much-needed pressure to Huddersfield. The Toffees were now just one point behind. All top strikers need a strong and focused mentality, especially under pressure. With Everton putting the squeeze on a faltering Huddersfield, it’s the big players, like Dean, that team-mates and supporters rely upon. The expectation of scoring, especially with all the talk of breaking Middlesbrough legend George Camsell’s record, must have weighed heavy on the broad shoulders of Dean. Huddersfield, despite having games in hand, wilted under the pressure, and by April’s end they were three points behind Everton – who only needed a point to be champions. As it was, Huddersfield couldn’t even push their rivals as they lost 3-0 away to Aston Villa. Everton were now officially the First Division champions. There was still plenty of drama, with talk in the terraces and papers surrounding whether Dean would break Camsell’s record of 59 league goals, set in the previous campaign as Boro clinched promotion to the First Division. With only three games left Dean stood at 51 goals, nine shy of the record. If there was one thing guaranteed with Dean, it was that win or lose, he would provide a spectacle with his shooting ability, power and touch. Two goals against Aston Villa in a 3-2 win for Everton and four against Burnley, as the Toffee’s won 5-3 away, brought him close to the record. It meant that a hat-trick was required in the final home against Arsenal. Sixty-thousand fans saw Dean score within the first five minutes; later on in the first half Everton were awarded a penalty which Dean dispatched with classic confidence. With just eight minutes remaining, the crowd looked on anxiously as Troupe crossed into the box. The unflappable Dean, waiting for his chance to break a record that many thought was unbreakable, attacked the ball and headed in. Not even an Arsenal equaliser could dampen the spirits inside Goodison. The crowd that day was lucky to witness the very best of England’s first world-class goal-scorer. Thanks to Dean’s record-breaking season he was now something of a celebrity. He was even paid to endorse Wix cigarettes with the line ‘England’s greatest goal-scorer declaring the taste to be excellent’. Offers also came to play football in the States with Arsenal’s Herbert Chapman also putting in a bid. Although Dean stated he had no desire to leave Everton it wasn’t really in his hands even if he had wanted to. After all, this was an era where the clubs had ultimate control over when and where a player would go. Over the next two years Everton suffered a blip and the ignominy of relegation in 1930. The team came straight back up and, in their return to the top flight, won the 1932 league title – with Dean scoring 45 goals in just 38 appearances. Although not as dramatic as the 1927-28 season, there was a controversial incident that added to the folklore of Dean. In 1932, an end of season tour was arranged in Nazi Germany. Prior to the six games, the Everton team was told that they would be required to do the Nazi salute before kick-off. Dean and his team-mates reacted furiously to the request. Led by their talisman, the players informed the officials that they were not going to do the Nazi salute, despite political pressure. Furthermore the players were incensed with the derogatory and racist cartoons about Dean’s appearance circulating before the matches. This refusal caused unbridled controversy, with the Nazi’s viewing it as a direct snub. From a propaganda perspective the salute from Everton, who were viewed as a major footballing heavyweight, and from one of the world’s greats like Dean, would have given the Nazis respectability across the world stage. It was this snub that led to intense pressure when England and Aston Villa later toured Germany in 1938. 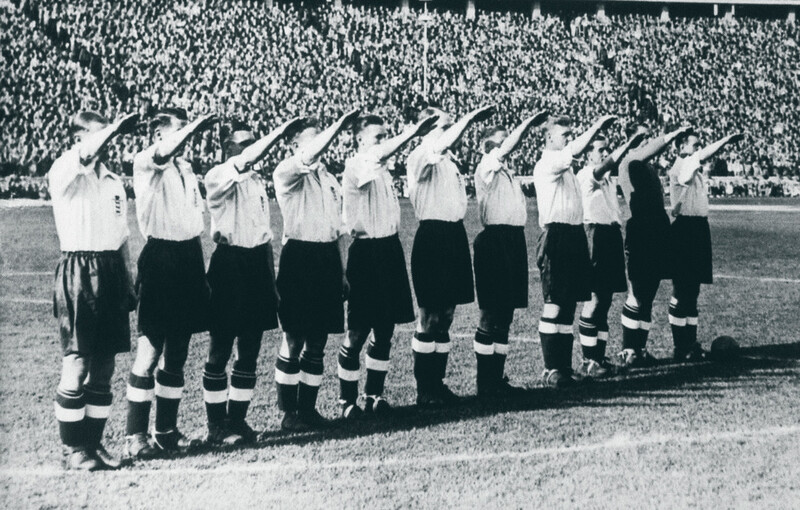 With the political position far more volatile than in 1932 – the fear that the slightest spark could start war – both teams were told to perform the Nazi salute. Aston Villa refused in their first two games but succumbed to the pressure in their third game, although the players did stick two fingers up after conducting the salute. England, of course, did perform the infamous salute, but such was the pressure from the Football Association and political bodies that the slightest issue could start another war, they ultimately felt forced to do so. The following year Dean officially became the first number 9 as he lifted the FA Cup for Everton after they overcome Manchester City in the final. It was the first game that numbers were printed on the back of players’ shirts, with Everton 1-11 and City 12-22. Even so, the Everton board failed to show their gratitude to one of their sporting icons; a man adored by the Goodison faithful. As with all clubs of that era – and for years onwards – players were seen as commodities, to be used and discarded at will. In effect, Dean was more or less left to clear his locker quietly after a deal had been agreed for him to join Notts County in 1937. It took Everton until 1964 to arrange a testimonial for Dean, with an England vs. Scotland game consisting of players from Everton and Liverpool. Although Dean had only scored three goals in nine appearances for The Magpies, he still had the draw of being a star when he signed for Sligo in January 1939. A huge crowd waited at the train station to see their new hero, while a later move to Hurst FC (now Ashton) in the Cheshire league earned the club £140 in his final game. For whatever reason, Dean only earned 16 caps for England despite scoring 18 goals in those appearances. There are stories that Dean was openly critical of the FA selection board but there is no evidence to confirm this. After finishing his career in football Dean followed the time-honoured tradition of running a pub, the Dublin Packer in Chester. He later became a porter at Littlewoods with the job arranged by Everton chairman Sir John Moores. In Dean’s later years he became seriously ill with influenza and had to be admitted to hospital in 1972. Four years later, following a blood clot, Dean had to have his right leg amputated. Sadly, it forced much of his time to be spent indoors. Despite ill-health Dean attended Goodison Park to watch his beloved Everton play Liverpool in the 1980 Merseyside derby, but suffered a heart attack whilst watching the game and tragically passed away aged 73. The goal-scoring statistics of Dean are phenomenal. At Everton he bagged 349 league goals in 399 appearances, whilst also scoring 37 hat-tricks. On average, it equated to 0.94 goals per game. In the FA Cup his 32 appearances saw Dean score 28 goals. In modern terms, there remains one record that Messi has yet to match: Dean’s 60 league goals in a season. His talent was ahead of his time, and his records still stand long after his death. William ‘Dixie’ Dean: football’s first great number 9.